October 28, 2014 – Kristen here from Dine and Dish. I always try to plan out meals that are simple and that my kids will all enjoy. Now that the holidays are approaching, it’s especially important because time is of the essence! Choose your base: Day old cooked rice works best because the moisture in freshly cooked rice will cause it to steam instead of fry. Cook the day/night before and store in the refrigerator overnight. 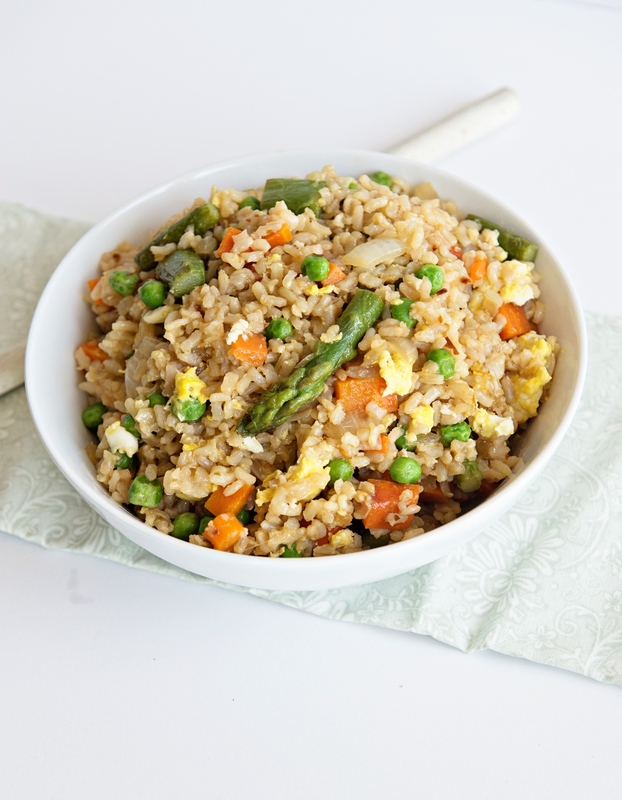 Add your veggies: Fried rice has endless possibilities. 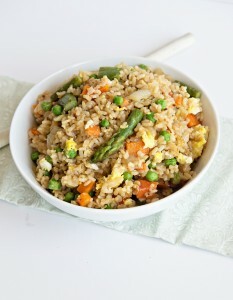 This recipe has onion, carrots, asparagus and peas, but tailor your rice to fit your taste buds! Cook ingredients separately: Try to keep ingredients cooking separately to help maintain their distinct flavors. Bring them all together during the final stages. I love this recipe for many reasons, and ease is top of the list. Buying all the ingredients at ALDI makes it for a one stop shop recipe. Add to the list that it’s incredibly tasty, you’ll soon realize you have a hit of a recipe on your hands. In a medium saucepan, bring water to a boil. Stir in rice, return to boil. Reduce heat, cover and simmer for 5 minutes. Remove from heat and stir, cover and let rest for 5 minutes. Meanwhile, heat 2 tablespoons of oil in a large skillet over medium-high heat. Add onion, carrots, asparagus and red pepper flakes. Cook for 3-5 minutes, stirring occasionally. Add garlic and continue cooking for 1 minute. Add rice, soy sauce and peas to skillet; cook for 3 minutes. Move rice to one side of pan and add remaining 1 tablespoon oil to empty space in pan. Add the eggs and scramble until cooked through. Remove from heat and toss well before serving. Recipe and Photo Courtesy of Kristen Doyle, Dine and Dish. Hi Marie, you can find the recipe for Creamy Pasta with Broccoli and Chick Peas here: https://www.aldi.us/en/recipes/main/pasta/creamy-pasta-with-broccoli-and-chick-peas/.